Red Rock, a Native woman from Montana, shakes a Subway cup full of change. She looks put together, like she has a place to stay, but she's living off the streets. Her eyes seem to wander in her skull and she wears a crooked smile that comes easy. A spirit full of love. She hugs the guy we've been playing with, a well worn fellow who looks like he just got off a 3 year stint from the fishing boats and spent the next 6 months on the pavement. He speaks like a pirate, but the words barely make it through his beard and out his mouth. Food stains his shirt and there are leftovers in his beard. He's not a mean drunk at all, you can see his soft heart underneath the rags and the mumblings. Red Rock embraces pirate jim and, seeing our guitars, she says she has a song. We welcome it. She starts into "Call On Granny" and Noah and I fumble to fit chords underneath the melody, but it proves natural. In moments we're pulling out the recorder. Noah exhibits the kind of trust and bravado that makes me weep with joy, handing pirate Jim the recorder and showing him how to use it. Listening back, you can hear his dizzy hand wavering in the middle of our circle, capturing Red Rock's song. she points out the rainbow in the evening's burly warmth. and the love on the ranch grows deep and wide. we learned how to love and live with pain. left us a farm and ranch and cellar that is broke. but we still call on Granny when things are bad. 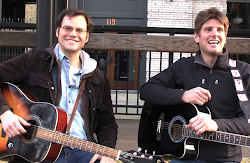 Give It To Me Rusty is a musical collaboration with Seattle's downtown homeless population. Since 2008, Noah Dassel and Aaron Zuege have adapted the stories of the homeless they meet face to face on the streets of Seattle. Give It To Me Rusty began when Dassel and Zuege needed a convenient place to play music after meeting in the summer of 2008. Occidental Park was the midpoint of their work locations and they decided to meet at the trolley stop to work on songs together. Things developed quicly and the curious passersbys, many folks living on the streets, soon began to offer their own lyrics and life stories. The jam sessions began to develop into a project. People had their own lyrics, and the duo was happy to cobble together accompanying chords. The first was "Lost Train" by Jim, a 60-something visiting seattle from colorado for a new ALS treatment. "i don't really need detox, i just go to meet the people" he said while he and a friend waited for the drunk wagon. Jim then went into pitching brutal black and white imagery about life, death, and and the battle of the train losing it's tracks. to something you left back home..."
On the next visit to the benches of the Square, Jim's pal, Dean, approached wearing a surf naked shirt and drinkin a tall boy. He was in remarkably better condition than our first meeting and a song emerged..."Give It To Me Rusty", about being a woman's secondhand man.